Numerous tales and legends exist in Zagreb and about Zagreb; some are remembered through the ages, other sink into oblivion, and even the origin of some is forgotten over time. 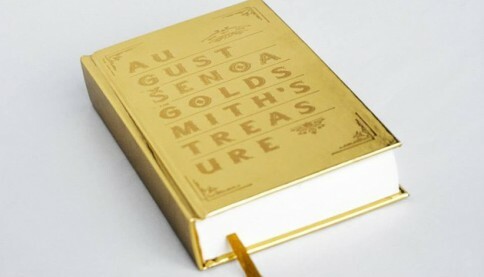 August Šenoa’s The Goldsmith’s Treasure has successfully endured the test of time. It captivated audiences at the end of the 19th century, and still manages to do so today. Intertwining love and history, The Goldsmith’s Treasure tells the most genuine tale of Zagreb – it leads us into the Upper Town, back to the 16th century, introducing us to its own Romeo and Juliet. Deciding not to let this tale be forgotten, the publisher, Spiritoso, reached for Croatia’s rich cultural heritage and gave The Goldsmith’s Treasure a new sheen. The novel is now available to visitors who want to get to know Zagreb in a truly unique way and take home an authentic keepsake – a book. The Goldsmith’s Treasure, translated from Croatian by Neven Divjakinja, is available in English for the first time ever. The book owes its design and layout to Hamper studio, which managed to combine the traditional and contemporary, the decorative and the minimalistic, as well as the rustic and the elegant. At the end of the 16th century, during the reign of King Maximilian II and Ban Đuro Drašković, the parish Church of St. Mark was surrounded by small wooden shacks in which various vendors and merchants sold candles, oil, bread, and other everyday items at a fair price to the kindly townsfolk of the noble town on “the hills of Grič”. The townspeople of old Zagreb were of the rather pious sort, even though they were in constant conflict with the noble bishops that resided in a separate estate known as Kaptol. They once even boasted before His Majesty that, thank God, there were as many priests and friars in their town as there were townspeople. But despite all their abundant and fierce piety, they recalled little of the Holy Scripture, in which it is written that the Son of God drove the merchants and bankers from the temple of God with a whip. The wooden shacks stood peacefully around St. Mark’s and even the noble gentlemen and priests would occasionally stop and browse through the goods. A most famous face among the merchants in the shacks was Pepper Biscuit Magda. Young and old, great and small knew Magda better than they knew the town drummer, Đuro Garuc, a tall man nicknamed “The Bishop’s Stick” by the townsfolk. Magda really was a peculiar figure. She was skinny as a candle and yellow as wax. Her nose was pointy, curved, and plum-like, with a hairy mole on top. Her face had more wrinkles than a peasant’s shirt. Her teeth did not ache, for she had none, and merely a few people ever saw her greyish, piercing eyes because the old woman kept them closed and would rarely open them to gaze into the world. Looking at her while she was hunched in her wooden shack wearing a white winged hat, one would think: “–There’s something about Magda.., she probably rides her broom to Klek Mountain every Friday or to a gathering with her sisters to have an infernally good time”. Truly, anyone would think that Magda was a witch. But her soul was not barren and her heart was never false. She was actually a very pious old lady. In her shack, there was a sooty picture of the miraculous Virgin of Remete and a brass lantern in front of it was lit in honour of the Virgin Mary and for the salvation of Magda’s soul. Magda would sit every day in her wooden shelter and run the beady, sanctified rosary through her hands, almost half-asleep. She would stop occasionally to warm her cold hands over a pot full of embers or to talk to a passing lady or the town bell ringer. She would usually whisper the Lord’s Prayer or the Hail Mary, come rain or shine. Surely, this is not something a witch would do! The nickname “Pepper Biscuit” was given to her because there was no woman of noble or common birth that knew how to knead those peppery biscuits called paprenjaci as well as Magda did. Because of this, her biscuits were very popular, and even the town judge, Ivan Blažeković, was known to spend a considerable amount of money on her biscuits from time to time. The old woman became a widow a long time ago. Her late husband was a bell ringer at St. Mark’s. And so she lived a humble life without any children or relatives, baking her biscuits every night in her home by the Stone Gate and selling them by day in front of St. Mark’s. The townsfolk did not remember her ever being young, nor did they notice her getting older; she was always the same. She was like an old painting that hung somewhere in a lone tower for countless years and never changed. Everyone saw that the old woman was making a considerable amount of money and was spending very little, so they wondered – as people often do about many things – why would Magda need all that coin? In truth, Magda kept an old sock full of dinars, groats, and even old ducats from the time of King Matthias in the corner of her painted wooden trunk. The sock grew thicker as Magda grew thinner. But why would Magda need the money? “To rest my soul,” she replied calmly to people who bored her with such questions, and continued to run the rosary through her fingers. Yes, to rest her soul! The good old lady, enchanted by a pious dream, would set aside one dinar at a time in order to save enough money to pay for masses that would be held at St. Mark’s after her death. Each year, on the feast day of St. Mary Magdalene, a service would be held for the salvation of her and her late husband’s soul. Encouraged by this thought, she worked diligently and with joy. Thus it is not strange that she was on good terms with everyone in town. But there was one man she was not on good terms with – the town barber, Grga Čokolin, who had his shop under the arches of an old town house on the corner of St. Mark’s Square. Grga Čokolin was a rather strange man. He was a skinny fellow. He had a fat head, round as a cabbage, with thick eyebrows above his nose and small, black, prickly eyes often fogged by wine. His nose was dull and wide, it curved upward, and was fiery-red. His face was smooth and beardless; the best advertisement of his trade. This was the outer face of the town barber and his soul had a similar lining. He was shifty, self-willed, and insidious. He moved in all kinds of places and had his soapy fingers in matters which should not have concerned him. It was not really known where Grga Čokolin had come from. He spoke like he was from Hrvatsko zagorje, but he was also known to occasionally greet a judge or chaplain in Latin. The townsfolk did not ask him about his home and, knowing that he had wandered into town from one place or another, did their best to remain on his good side because his words stung like the whip of the Devil himself. He had seen much of the world, or so he claimed. He boasted that he had served in the Ban’s army under the standard of Petar Bakač, and that he was wounded at the Battle of Ivanić Grad. He talked a lot about the Turks and his own bravery. When people objected that he may be exaggerating, he would cry out in anger, pointing at his scarred forehead: “Not true? Look here! This is where I felt the kiss of a Turkish sabre! Thank God that it did not cut any deeper because there wouldn’t be anyone here to shave you!” The people argued that you could also get all kinds of scars while drunk, but Grga insisted that he was a hero. He was certainly no saint. Jokes and pranks were a part of his life and no one was safe from his tricks. He cured the townsfolk with camphor and leeches. He cured livestock with altar bread. He shaved both the gentlemen and the poor peasants from Trnje. He would spend the rest of his time drinking, gambling, and getting into trouble. There was talk that he was even engaged in some foul business – that he brewed all kinds of potions or worse. These were, of course, only rumours, but it was well known that Čokolin did not fast on Wednesdays and Sundays. It is therefore not strange that Magda did not look kindly to him, but there was one event that caused the barber and the old woman to become mortal enemies. Magda lived by the Stone Gate, across the gardens of the Drašković family, in the house of Petar Krupić, goldsmith and town elder. Petar Krupić, a nobleman from Velika Mlaka, had lived in Zagreb since he was a child. Later he did a lot of traveling while learning the goldsmith’s trade. He even went as far as Venice, where gold is worked most delicately and spun into fine strings. After a lot of work and studying he returned to Zagreb, was accepted into a guild, and acquired his father-in-law’s shop and house by the Stone Gate. Even though business was good and he was extremely happy, he was never arrogant and did not tarnish his name with bad deeds. The townsfolk soon grew to love him and elected him their elder because of his honest heart and sharp mind. However, his fortune changed rather quickly. To his great sorrow, his faithful wife died and left behind their only child – Dora. None other than Magda was the godmother of this same Dora, and Dora was the apple of her eye. Krupić had no time to raise his little girl. The Turks were a constant threat, so he had to take care of the provisions and organize the town’s defences. In addition, the noble houses of Zrinjski, Bakač and Alapić were also troubling the townsfolk of Zagreb, and there was no end to the quarrelling. The townspeople of Zagreb even fought amongst themselves, almost out of habit, and there was much work for the judges and peace keepers, who often received nothing but thanks, praise, and two pairs of boots as pay. He had to get on with life and work day and night. Because he was busy, either with his work as a goldsmith or with town affairs, Krupić was grateful for Magda’s presence. He knew that her soul was pure gold and that she would guide her goddaughter with a pious hand to the path of both earthly and eternal happiness. But Dora did not require that much attention and care. She was good-natured and, having witnessed no evil, would have found the right path on her own. She was very bright and lively. She was so self-confident by the time of her late childhood that she was nicknamed “The Goldsmith’s Little Know-it-all,” because she – which was no trivial matter at the time – had already learned to read and write from the town teacher, Blaž Dragašić. Oh, but what delight when the rosebud turned into a rose, and the little girl into a young lady! What delight it was to look upon her! On Sundays and holy days, she would walk across St. Mark’s Square back to her house after early mass. She had delicate legs and wore elegant red shoes on her feet. Her head swayed under her parta, and her black braids fell down her blue vest lined with lamb wool. She would hold her big, silver-bound prayer book close to her bosom and walk shyly along, looking straight forward so you could not see her bright eyes under her silk eyelashes. Anyone would be tempted to say that she was a saint who had come down from an altar to walk among the common folk and to bring joy to the hearts of her sad people. But Dora could boast of more than having a pretty face. The only thing more beautiful than Dora’s face was her soul. But there were other reasons to boast, as well. Reasons as valuable as gold. The old saying goes: “A good reputation is worth more than a pretty face,” and Dora had both. Therefore it was not strange that all notable young men offered her apples, or came to visit, dreaming about the goldsmith’s greatest treasure. But they did not get one tiny piece of that treasure, because they found the goldsmith’s doors closed. These things were not at all out of the ordinary, but what was strange and which no one in town dreamed of, was this. What no gentleman or gentleman’s son dared do, the wretched barber, Grga Čokolin did. He wanted Dora! Him, of all people! The ugly will always seek the beautiful, the frog would much rather be a noble horse, and Čokolin wanted to become the goldsmith’s son-in-law! He went to Magda first, because he knew that the old woman was the key to Dora’s door. But Magda just pretended not to notice what he was talking about. Finally, the barber found his courage and decided to try his fortune. One day he got up early, stood before a brass mirror, and made himself ready as best he could. He put on his wool coat and his shiny silver-laced boots, tied a red silk scarf to his belt, and as the townsfolk were returning home from mass, he walked straight to the goldsmith’s door. “Good morning, bonum mane, master Krupić,” said the well-dressed barber. Both of them grew silent. At that moment, Dora put a flat glass bottle and two small glasses on the table, wished their guest a good morning, and left the room without ever raising her gaze. Krupić remained silent, knowing roughly what this visit was about, and Grga was at a loss for words since the girl suddenly appeared in front of him. “These are serious words,” interjected the old man. “You’re quite right,” added Krupić. “I have thought about this for a long time, considered all the maidens in Zagreb, and finally, re bene cognita, here I am to ask for Dora’s hand in marriage! – No offence, master Petar! Dixi!” said Grga with great anguish. “No hard feelings!” stuttered Grga, not knowing what to do with his hands or legs, and finally went home pale and depressed. Dora was listening to this conversation through a pane in the wall that separated the room from the kitchen and heard the whole affair. She giggled so hard she almost bit her tongue. Grga was so distressed that day that he cut the town chaplain, Šalković, so deep that the chaplain let out a cry of pain and despair. Magda had discerned what kind of game Čokolin was playing – so where he expected to find a key, he found a padlock, which spoiled his plan. That and more Magda said to Krupić, but the goldsmith knew well enough on his own not to give his only daughter into the hands of a no-good drunk. That is how Pepper Biscuit Magda and Grga Čokolin came to be on bad terms. The barber was boiling with anger and drank until his nose was wide as a peony flower, all the while thinking and scheming how to make the old woman’s life miserable. At “Black Janko’s” tavern by the Stone Gate, the usually sociable barber would crawl into the darkest corner and spend the whole day rotting over a jug of wine. It was not long before the barber got his revenge. The noble magistrate had announced that henceforth the vendors were not allowed to sell more than ten candles on the pound, and that they would be fined one Hungarian forint for every extra candle. Suspecting no evil, the old woman let her guard down and Čokolin went straight to the town judge to tell him that she disobeyed the order issued by the noble magistrate by selling smaller candles. Magda had to go to court. To court! She felt as if a poisonous arrow had pierced her heart. All her life she never had any business with the court. She never owed anything to a living soul, and now she had to experience this disgrace at such an old age! “I obey the laws and town superiors, and it is the holy duty of every honest man to be careful that the orders of the noble magistrate are obeyed!” – said the weasel, Čokolin, before the court. “God help us if everyone obeyed their superiors like you do, master Čokolin! I pray that this mischief won’t be taken into account on the day of your final judgement, but I assure you: that eleventh candle won’t light your way into Heaven!” – said Magda. The old woman unwrapped a forint out of her handkerchief and set it on the table in front of the judge. Tears came to her eyes! When she returned to her shack, she felt like all the stone saints had fallen down from the church door and straight onto her old heart. The barber’s misery was somewhat soothed with this act of revenge, but his soul could not find peace. He wanted to take greater revenge on the people who had caused his suffering. Grga Čokolin would take revenge on the old goldsmith and his precious daughter, of whom he was not deemed worthy.